Ordinarily, Voltage Controlled Amplifiers are pretty routine. But by combining 2 VCAs, a Balanced Modulator, a White Noise Source and Envelope Generator in a single module and interconnecting them with a powerful normalization design, the 9710 redefines what a VCA module should be. At the highest level, you can use the 9710 like a traditional VCA but with the added convenience of a built-in Voltage Controlled Input Submixer and ADSR Envelope Generator. This configuration of elements allows a couple of signals to be mixed together before being processed by the VCA which is controlled by the ADSR. It would ordinarily require three or four modules and a handful of patch cords but is embodied as a single element in the 9710. And the versatility of individual modules is not sacrificed because patch cords can be used to override the normalization and access progressively lower level functional sub-groups or even the individual elements. The "L" and "R" VCAs are normalized for source pan mixing (morphing) either with a knob or a single CV applied to the CVL input but they can also be accessed as individual VCAs. The "A" VCA uses a 1496 type Balanced Modulator IC and normally it's Modulation source is an exponential (10dB/V) output of the ADSR. 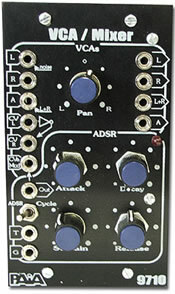 It can be used as a Balanced (Ring) Modulator by patching an external signal source into the CVa (Modulation) input, which overrides the ADSR and expo circuit for a direct linear input. Many artists prefer linear dynamic response when building percussion sounds because they have much more "punch" than the technically correct exponential response. 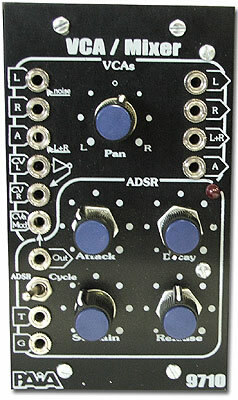 Patching CVa to the ADSR output bypasses the expo converter for linear ADSR response. The Envelope Generator is a full-function ADSR with Attack (500uS - 5Sec), Decay (2mS - 7Sec), Sustain Level (0 - 10V) and Release (2mS - 7Sec) controls. Separate Trigger and Gate inputs allow re-triggering. The Cycle switch enables self-triggering for a Low Frequency Oscillator function with independently adjustable rise and fall times. When being used as an LFO the Gate inputs turn the oscillator off and on and Trigger inputs sync it to an external source. The front panel LED brightens and dims to indicate Modulator output. An important characteristic that the 9710 shares with other 9700 series modules is DC coupling throughout. Any of the VCAs can process Control Voltages as easily as audio signals - one of the pan VCAs can ADSR modulate an LFO vibrato, for example, or one of the pan VCAs can serve as an attenuator for the ADSR. The 9710 has on-board voltage regulators and typically uses a nominal 18V bipolar supply which need not be regulated. Systems that include a 9700 midi2cv8 MIDI>CV can use it as a module power source or the 9770U Power Supply bi-polar supply is available. You can also use regulated bi-polar 15V supplies from other manufacturers with appropriate cautions to preserve the 9700 Star Ground system. The 9710K Triple VCA Electronics Kit includes all electronic parts, circuit board, switch, controls and knobs. Does NOT include panel or jacks. Check out the Sound Sample page! Don't forget to order the FracRak Accessory Kit. View the 9710 VCAs and Balanced Modulator schematic. View the 9710 ADSR Envelope Generator schematic. Check out the 9700 Module series overview.